Eunomius has everything figured out. Which pretty much summarises everything that is wrong with his theology. Divinity is, Eunomius claims, unbegottenness (which is why he thinks that the Son cannot be divine). Basil is aghast: “How much arrogance and pride would it take for someone to think that he has discovered the very substance of God?” (Against Eunomius, 1.12). Eunomius is like every other heretic: an aggravating know-it-all. Arius is certain that the Son is not co-eternal with the Father. Apollinaris, agreeing that Arius must be wrong, knows that Christ can be fully divine so long as he is not fully human. 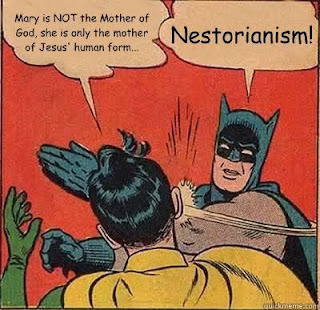 Nestorius, going with the dismissal of Apollinaris, figures out how the divine and the human natures interact in Jesus (even in Mary’s womb!). Eutyches, standing with the church in rejecting Nestorius, solves the metaphysical problem of two natures (or one or three—the numbers all blend together). The early christological heretics all claim to understand the relation of the divine to the human in Christ. Each heretic solves the problem with confidence, but the church confidently keeps the problems and so keeps the faith. The orthodox tradition maintains the tension between the knowable and the unknowable in its affirmations. We cannot know what divinity is in itself, just as we hardly understand the nature of humanity, but it seems necessary to say—if salvation is real—that Christ is fully divine and fully human and that these two “natures” are not merely pressed up against each other or mixed together, but are somehow united in the person of Jesus Christ. But orthodox theology rarely attempts to specify that “somehow”. The heretics prefer to iron out the creases in their doctrines of God and Christ, leaving a smooth surface where everything is laid bare. But the orthodox tradition leaves the bedsheets in a crumpled pile, with hidden and mysterious crevices. Ironing the divine linen is an impossible task, for God is like a fitted sheet—accomodating yet unwieldy. Talk about God will always have hidden depths and untidy corners. “Heretics were too clever by half, thinking they could know God precisely so as to define the divine Being in all exactitude” (Frances Young, God’s Presence, 253). Rowan Williams points out that the word “heresy” comes from the Greek hairesis, which connotes making a choice that creates division—“a heresy in St Paul is… choosing to belong to this little group rather than the whole fellowship” (“What is Heresy Today?”). The heretic is the one who looks at the doctrine of God and says “I understand this” or “I can prove that this is so” in such a way as to exclude all other understandings. The creeds, by contrast, were written to establish unity within the church through prayer, contemplation, and interpretation. To riff on Robert Jenson, there is nothing as capacious as a creed.